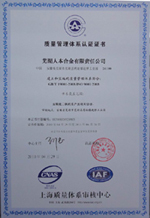 According to the demand of ISO9002 international quality system, our company established quality assurance system in 1998, having formed document quality system including quality manual, procedure file, management file, work-guide book and quality records etc.. It has standardized every quality activity of the company and ensured the sustaining stability of product quality. 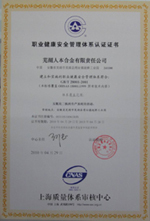 In 1998, it received ISO9002 international quality system certification and in 2001 received the reevaluation certification of the new version of ISO9001：2000.